“My Father's Footsteps” is another tune from Butch Robins’ 1995 album Grounded Centered Focused (HHH-CD-108). 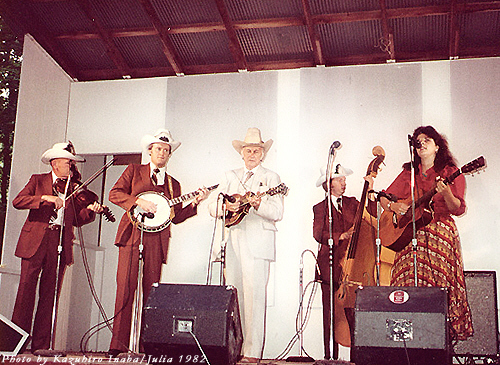 Both Bill Monroe and Mike Compton can be heard playing mandolin on this track. This tune was originally recorded by Butch on a different record, fifteen years earlier. His third solo banjo record The Fifth Child (Rounder 0130) features Alan O’Bryant (guitar), Blaine Sprouse (fiddle), Randy Davis (bass) and Sam Bush (mandolin) playing this tune. Bill Monroe’s father, James Buchanan Monroe (also known as “J.B.” or “Buck”), was born in Ohio County, Kentucky, on October 28, 1857. J.B. was a well-educated man who, at the turn of the century, bought and began expanding his farm on Pigeon Ridge (adjacent to Jerusalem Ridge) outside of Rosine, Kentucky. On August 2, 1892, J.B. married Malissa A. Vandiver with whom he'd have eight children. According to Julia LaBella (occasional guest with the Blue Grass Boys, Bill Monroe's caretaker, and alleged girlfriend), this song is meant to represent Bill trying to keep up walking in his father’s footsteps while plowing the fields. The hiccup at the end of the second part is a tiny Bill stumbling and picking himself up. This tune was also recently recorded by Sharon Gilchrist, John Reischman, and Scott Nygaard on their album Harmonic Tone Revealers. It's my father’s birthday this month so I figured this tune would be a nice one to write about for my Monroe Mondays series. My dad is a terrific banjo player and by far my biggest musical influence. I'll always be following in his footsteps. Here’s me playing the tune based on both Monroe’s and Butch Robins’ versions – at least as much as I could play while dodging mosquitoes and avoiding falling off of this cliff overlooking Lake Whatcom outside of Bellingham, Washington. Butch Robbins The Fifth Child. EBay. N.p., n.d. Web. 4 July 2017. "Butch Robins - The Fifth Child." Discogs. N.p., n.d. Web. 05 July 2017. "Grounded Centered Focused - Butch Robbins." Allmusic. N.p., n.d. Web. 4 July 2017. <>. Moss, Jim. "Bluegrass Newsletter April 2006." Candlewater. N.p., Apr. 2006. Web. 4 July 2017. Robbins, Butch. "Butch Robins - My Father's Footsteps." Facebook. Facebook, 21 June 2015. Web. 05 July 2017. Smith, Richard. Can't You Hear Me Calling: The Life Of Bill Monroe, Father Of Bluegrass. N.p. : n.p., n.d. Print.